The state of Goa is a tropical paradise located on the west coast of India. (See Map of Goa). It is only a quarter the size of Wales but is unique from the rest of India because of its history and geography. Goa has idyllic white sandy beaches and warm tropical waters. The weather in Goa is generally split up into the dry season (Holiday Season) which stretches from October through to May and the Monsoon from June through to October. During the holiday season you are pretty much guaranteed sunshine and clear skies. The monsoon can be very unpredictable as it can start as early as May or as late as the end of June and similarly, finish anytime between the end of August to the middle of October. If you travel to Goa between October and May you are nearly always guaranteed beautiful clear skies. 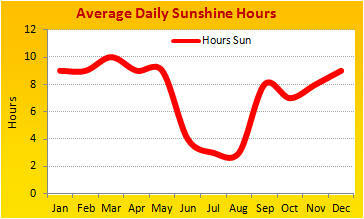 The daily sunshine hours are constant, between 9 and 10 hours per day, and the average temperatures, a warm 33 degrees. During this period there might be very short lived thunderstorms amounting to one or two for the season. The sun is very powerful and tourists especially can quickly become dehydrated and sun burnt. It is recommended to use a very high factor sun cream and drink plenty of water during the day. A local ‘fresh lime soda’ (fresh lime juice mixed with sugar and salt) is also a great way to combat dehydration, although having salt in your drinks takes a little bit of getting use to. Rehydration Salts can also be bought from chemists to replace the salts lost during the day. Throughout the year the sun rises in the morning between 6:00 and 7:00am and sets in the evening between 6:00 and 7:00pm,. Almost all of the yearly rainfall occurs during the monsoon (June to October). 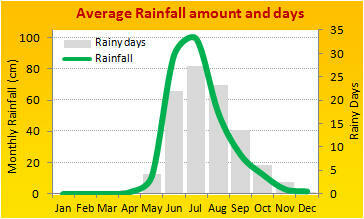 The rains usually start gradually in May/June and after a little break return in force. June, July and August usually have the heaviest rainfall, May, September and October usually have large breaks between showers and the locals often sheter under a tree or shop front for the shower to pass. The humidity in Goa gets into the 90's during the monsoon which is stifling - even doing the lightest exercise can be draining. The heat and humidity can have a detrimental effect on stored clothing with mould setting in. 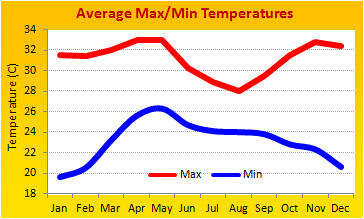 During the season time it is lower but stil usually in 70 and 80's. 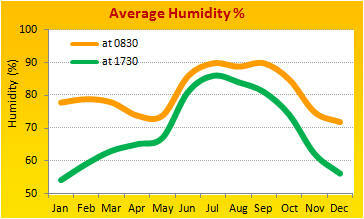 During peak season (Dec to Feb) there is a cool spell in the evenings which is very welcoming. During the season, the beach and sea are home to thousands of tourists. The sea has a warm bath feeling as it maintains a temperature of above 27 degrees. You must however be careful when venturing into the sea as there can be strong waves especially in late afternoon and strong under-currents which can catch you unaware. 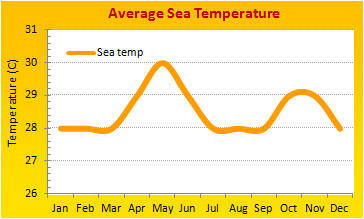 If you are a confident swimmer and stay within your depth you can easily enjoy the warm waters during the season. During the monsoon it is not advised to enter the water at all as the waves become very rough and drownings are quite common.